Sweet and nutty, butternut squash is a vegetable that is as tasty as it is versatile, and well worth using more of in the kitchen. Roasted or braised or mashed, puréed into soup or incorporated into stews, pancakes or breakfast muffins, butternut squash adds sweetness and sustenance to so many different types of dishes, both sweet and savoury. Butternut squash is a versatile ingredient, suitable for use in sweet and savoury dishes. Butternut squash has a tough skin but this can be removed easily with the right technique. Butternut squash can be oven-roasted whole with the skin on for ease. This seasonal vegetable is known for its versatility. 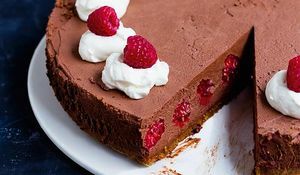 It can be roasted, braised, pan-fried and even baked into cakes. 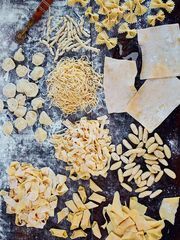 Scroll down to find out more about how to cook with butternut squash and to see some of our favourite squash recipes, including a Squash, Brown Butter & Sage Quiche from Claire Ptak's The Violet Bakery Cookbook. With its tough skin, butternut squash can seem tricky to cut at first. Get yourself a sharp knife and a secure chopping board. Trim off the top and bottom of the squash, then slice it in half lengthways; start with the long "neck" section by inserting the tip of the knife at the point where it meets the round base, and bringing the knife down in a swift motion. Cut the base section in half and scoop out the seeds with a spoon (you can use these later). Now it's up to you. Peel the four sections using a vegetable peeler (if needed), then cut into wedges, chunks or cubes depending what you're using it for. Roast your butternut squash whole in the oven. There's no need to peel it or prep it first. Throw it in while you've got the oven on (it'll take about 45 minutes to an hour, or slice it in half to speed up the process), then use it in the days that follow, mashed onto hot toasts with a drizzle of olive oil, folded into pancake batter, blitzed into hummus or simply thrown into any manner of soups or one-pot dishes or bakes. There are so many ways to use butternut squash. Here are some of our favourites. Roasted. 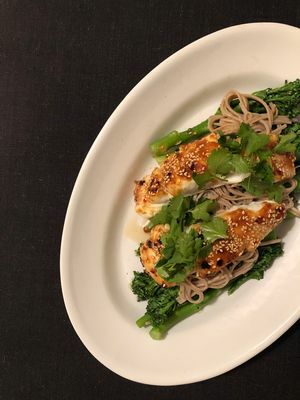 Slice it into wedges and roast in the oven at 200°C until sweet and caramelised, then toss through grains or green leaves for a filling salad. 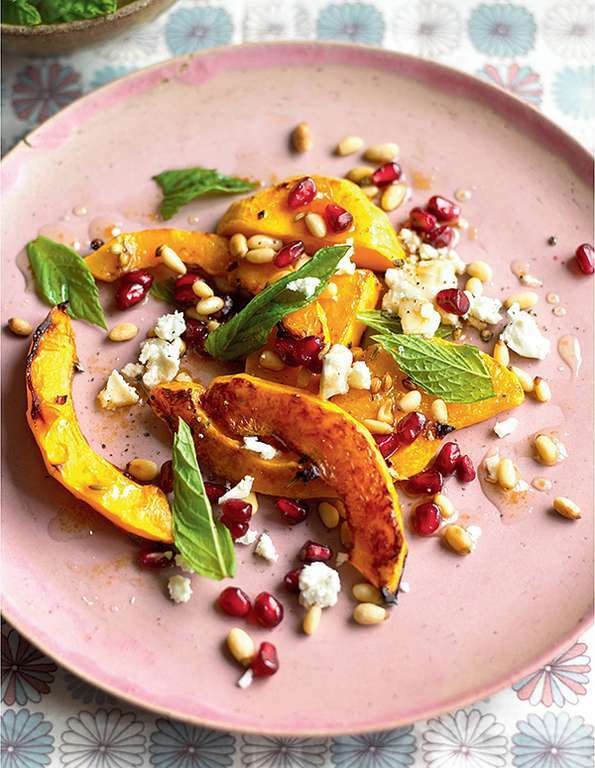 Butternut squash goes well with feta, mint and pomegranate in this simple salad recipe. Braised. Squash stands up well to pungent, fragrant spices, such as cinnamon and star anise, and Asian ingredients, such as soy sauce. Throw cubes of butternut squash into a wok and cook with spices, soy, sugar and a good splash of water until tender, sweet and delicious, like in this Chinese-style recipe. 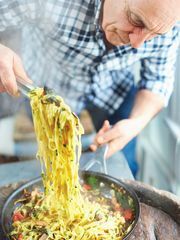 Or go down the Italian route with this braised Butternut Squash and Penne dish from Gennaro Contaldo's The Pasta Book. Baked. Steam squash until tender, then pair it with pasta and a creamy sauce in this delicious Butternut Squash Gratin, or throw it into a veggie squash and leek pie for a hearty filling. In a cake. Grated squash acts much like carrot in a cake, providing moisture and sweetness. Try it in these Orange Squash Cupcakes. In a one-pot wonder. Butternut squash works amazingly well in curries, stews and soups, especially as it stands up so well to bold flavours. Give this Sri Lankan Butternut Squash Curry a go, or Jamie Oliver's Chicken and Squash Cacciatore or this Curried Butternut Soup. None of these floating your boat? Here are two more crowd-pleasing butternut squash recipes. 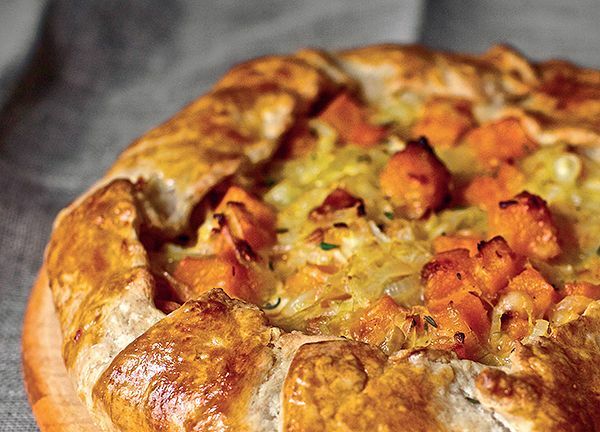 This tasty Butternut Squash and Caramelised Onion Galette recipe from The Smitten Kitchen Cookbook is on another level. A great veggie crowd-pleaser you could serve in place of your usual Sunday roast. 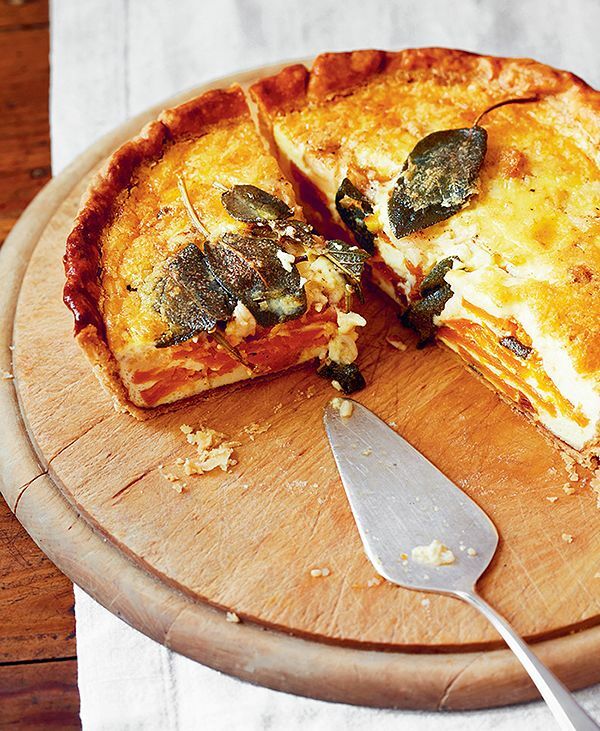 This delicious Squash, Brown Butter & Sage Quiche recipe from Claire Ptak's The Violet Bakery Cookbook combines butternut squash and sage (a classic combination) for impressive results. Have you been cooking with butternut squash this season? 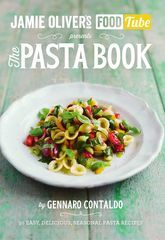 We'd love to see your creations on Twitter, Facebook and Instagram @thehappyfoodie. 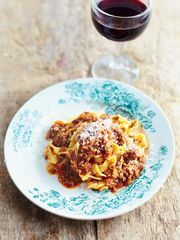 Chorizo is a wonderfully versatile ingredient. 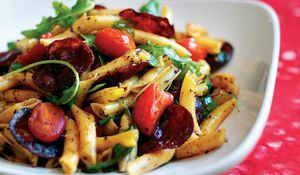 The smoky Spanish sausage works brilliantly in all manner of dishes, lifting stews and bakes out of the ordinary and providing bite and substance to summer salads. Enjoy a selection of our favourite chorizo dishes and put a little Spanish sizzle into your cooking.